Dental implants are the new gold standard in tooth replacement, and can help restore your bite's functionality and your sense of confidence. That's why we're pleased to offer a full dental implant procedure (implant, abutment, and crown) for $3,000! In addition, a $125/month payment plan is available for qualified customers with credit approval. At Dental Wellness Team, we want to help each of our patients love their smiles. For patients experiencing tooth loss, Dr. Daysy Pinero offers treatment to help restore your natural-looking, comfortable smile with dental implants. Are you missing one or all of your teeth? Dr. Pinero is one of the only dentists in Coral Springs to offer surgical dental implant placement. If you’ve lost a tooth (or teeth) due to injury or aging, dental implants could be the right solution to help repair your oral health and rejuvenate your smile. Modern tooth restoration has never been better! 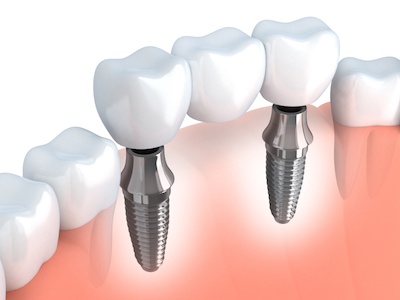 A dental implant is a titanium post that acts as an artificial “tooth root”, providing a secure support to permanently anchor your new tooth, bridge or denture. It is topped with a dental crown, providing a chewing surface and restoring the appearance of the missing tooth. At Dental Wellness Team, we offer same day dental crowns using advanced CEREC technology. Dr. Pinero can fabricate your new crown in just one visit! With All-on-4® dental implants, you can enjoy a brand new smile in just one day. All-on-4®, often also referred to as Teeth in a Day, is a treatment concept that rehabilitates an arch by precisely placing four implants to support a permanent, fixed denture. Implant-retained dentures are secure and won’t slip, allowing you to eat and talk without self-consciousness. If you are a good candidate for All-on-4®, after your procedure is planned you can expect to have your temporary teeth in just one day! Everyone’s case is unique but the vast majority of the work done by Dr. Pinero is typically completed before the implant surgery. Schedule Your Dental Implant Consultation With Us Today! If you have question about dental implants, tooth pain, or any other services Dental Wellness Team offers, give our office a call. We care about our patients getting the care they need and understanding their procedures fully. A consultation with Dr. Pinero is the perfect way to answer all of your question and determine if dental implants could be the best solution for your smile!